We look forward to meeting your family this Sunday! TableKIDS happens every Sunday at our 10:15 a.m. service in Columbia Heights and at our 5:00 p.m. service downtown. More information parish-specific programming is below. We use Orange curriculum for all of our TableKIDS: the First Look curriculum for children through age five and 252 Kids curriculum for children in grades kindergarten through fifth grade. Each week's lesson includes a few group activities, a Bible story, small group time, and prayer together. We encourage kids in grades six and up to participate in the full service, including serving on ministry teams. Parents can follow along with their kids' lessons by downloading the Parent Cue App. A healthy learning environment is a safe learning environment! Prior to serving, all members of our TableKIDS team complete a training and must pass a background check. Many people on our leadership team are CPR / First Aid certified and we aim to always have at least one volunteer in the TableKIDS classroom who is certified in First Aid and CPR. Before you bring your child to TableKIDS, we must receive a signed Parent Acknowledgement form which provides us with all necessary information pertaining to your child's allergies, legal guardianship, etc. You will also receive a copy of our Child Protection Policy. This documentation is available on-site on Sunday mornings or you can click the button below to complete the process online. We host a Parents' Night Out event on the first Thursday of every month for all families that attend the Table. This is a space where we provide snacks and childcare so parents can have some time to themselves. 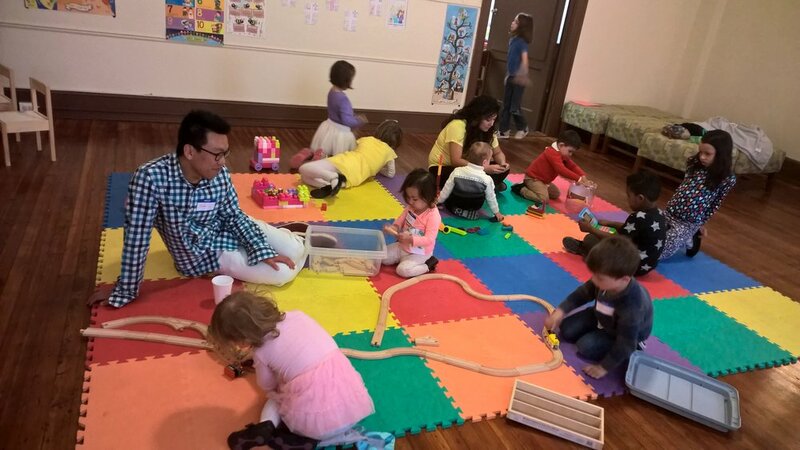 We host this childcare opportunity at our Columbia Heights Parish. If you'd like to learn more, contact Erin Byrne at erin@thetabledc.org. At the 10:15 a.m. service, children sign in before service begins, receive a name tag, and then participate in the beginning of our worship service by singing songs with their families and the rest of the congregation. After a few songs, TableKids (infants through grade five) are dismissed to classrooms for the rest of service. Our TableKIDS volunteers meet the children at the back of the sanctuary and take them to class. Parents/guardians pick up children after service in the Fellowship Hall. At this time, we do not offer TableKIDS at our 11:15 a.m. service. We have a separate nursing and changing room that is available to parents of infants at any time. For more information about TableKIDS at the Columbia Heights parish, contact Erin Byrne. At the 5:00 p.m. service, parents sign-in children and drop them off at the beginning of service in the chapel on the second floor. Pick-up is directly after service in the same location. TableKIDS programming at this location primarily serve families with children age five and under. For more information about TableKIDS at the Downtown service, contact Charla Everhart Lum.